We are Art Teachers… which means our bulletin boards should all be masterpieces right?! Uh no.. think again! Creating a bulletin board is tricky to say the least.. I mean stapling up a huge sheet of roll paper that is double the size of you without wrinkling the paper, making sure your letters are on perfectly straight AND centered, and trying to find one of those “cutesy” pre-made boarders that match or that you even have enough to piece it together to fit all the way around!? Give me a break! I teach in 2 buildings so I have a total of 8 bulletin boards, and that doesn’t even count the ones in the hallway that display student work! I really struggle with coming up with a THEME for each board that is actually relevant to Art Education and our curriculum, we don’t want just “stuff” posted up that isn’t useful to us. So tell me! What do your bulletin boards/ displays look like?! Post pictures if you can! Wouldn’t it be nice if art teachers could have a substitute that actually KNOWS art? Well, most of us aren’t that lucky.. We have ALL had projects ruined from a sub and it’s devastating! So we have a choice to make, do we let the sub teach the lesson and continue a project that we have been working on and risk a disaster OR do we just let them teach an easy generic lesson that will put your classes behind all the others. I think this is the reason that most of us in education have to be on our death bed to call in sick! I wanted to share with you today my sub tub and sub binder that I use if I MUST take a day off. Be sure to include ALL schedules in this portion of your binder: Normal Day, 2 Hour Delay, 3 Hour Delay, Full school calendar, and a” Duty” schedule if you have an AM or PM school job. I included pictures in my binder so the sub could see EXACTLY what I was talking about. Pictures are much easier than trying to describe your room and where supplies are located. Short descriptions of what each area in my classroom is. Some substitutes may not be familiar with the technology in your building, a quick reference guide is always helpful to a new person in your classroom! Typically subs don’t contact the parents, but if the sub leaves me a note on my “Art Room Update” and it is serious enough I will fill out my OOPS form and send it home with the student to have signed and bring baclk. Ill include this as a free Printable too! Include all fire drill information here! Any time I see “Free Printable” on Pinterest that is Art related I print a class set of it off and stick it in my Sub Tub just in case I have to call in sick and need something in a hurry, I just grab from here! I have a file for each grade level. I made these cards for each grade level and laminated them. I use these to clip to each grade levels worksheet or project. Cards clipped to the grade levels assignment. If you would like me to email you a copy of any of my “Printables” just comment here with what you want and your email address! The kids LOVED this activity! Colored shaving cream painted on BIG sheets of foil. Can you say sensory explosion?! 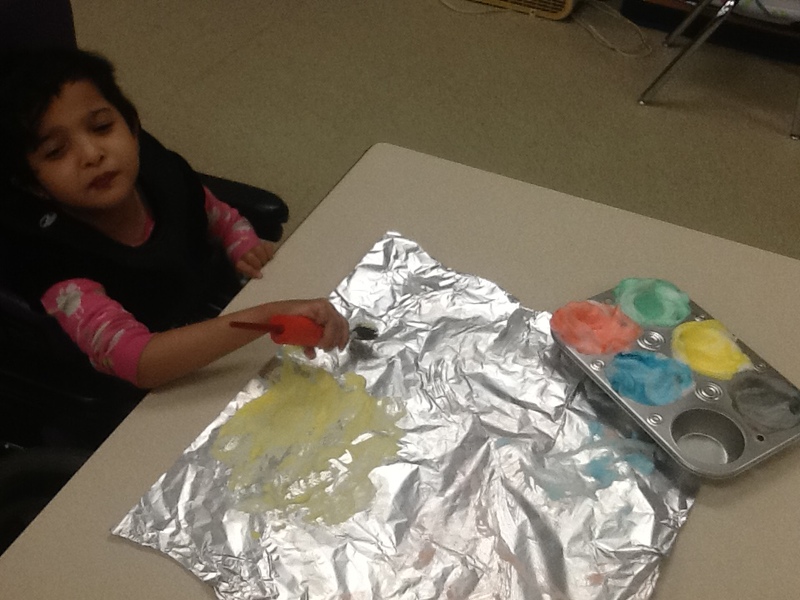 The kids loved the sounds that the foil made when they were painting on it with the brush. Squirt shaving cream in each Muffin Tin. Lay out sheets of foil on the tables. Let the kids explore painting and mixing colors on the foil! This project is one of my favorites for 5th graders, and they love it! I begin the lesson introducing Pop Art and that it actually means “Popular Culture” or things that are famous and recognizable during that time period. I then begin talking about Andy Warhol with a PowerPoint of images of him and his work. We talk about repetition and how he painted the same thing over and over again, for example, Campbell’s Soup cans and Marilyn Monroe. 81/2 X 11 White copy paper- Cut in half. 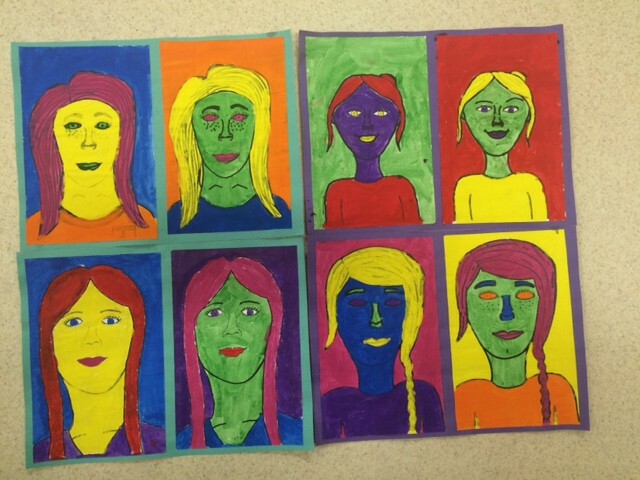 Introduce Pop Art and Andy Warhol- show examples of both. Guide and instruct the students on drawing their self portrait in pencil. Be sure their head is large and they Fill the page. I talked with my students about proportions of the face and being sure they draw light in case they make a mistake it will be easier to erase. Trace ALL the pencil lines in Sharpie marker and erase the pencil marks. Now, you are going to copy each of their drawings on a copy machine 4 TIMES. That way the students have 4 exact copies of their artwork. What I do is lay 2 drawings on the glass and copy 4 at a time. Once you get into the groove it goes really fast! I always keep their originals in a pile and give these to the students in case of an emergency and they mess up. 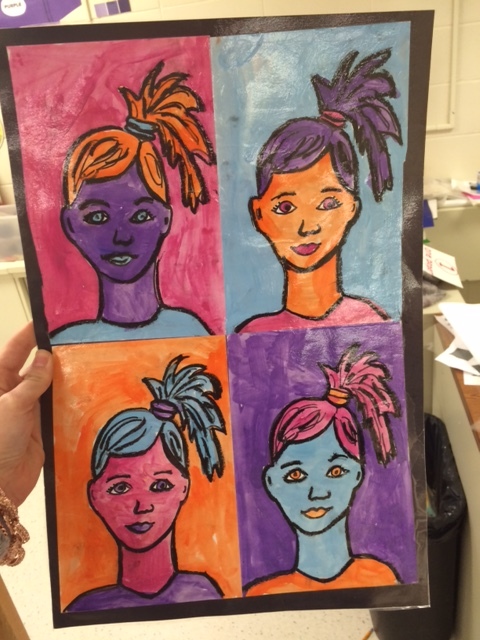 Now each student has 4 copies of their self portrait and they are going to begin painting in each one. I tell the students they can only use 4 colors of paint and all 4 of the paintings must look different. Students must use a different color combination on each one. My advice to them is to paint 1 “section” at a time on each one. For example go through and paint the hair on each one a different color. Then, go through and paint the lips on each one etc. This helps them keep track of each color and prevent them from painting an area the same color on accident. Comment below if you would like me to email you the lesson plan and the PowerPoint I used! I teach a Functional Life Skills (FLS) special ed class twice a week for 30 minutes. The class consists of 10 students that are between Kindergarten and 7th grade, talk about a variety of motor skill level! I do have 4 assistance in the classroom with me to help the students (hand over hand) with their fine motor skills. Since I see this group twice a week I usually do Mondays as sensory art and Fridays we focus on the actual production of art by creating a project to take home. Although I was very intimidated by this very diverse group at first, I have grown to love working with each individual! 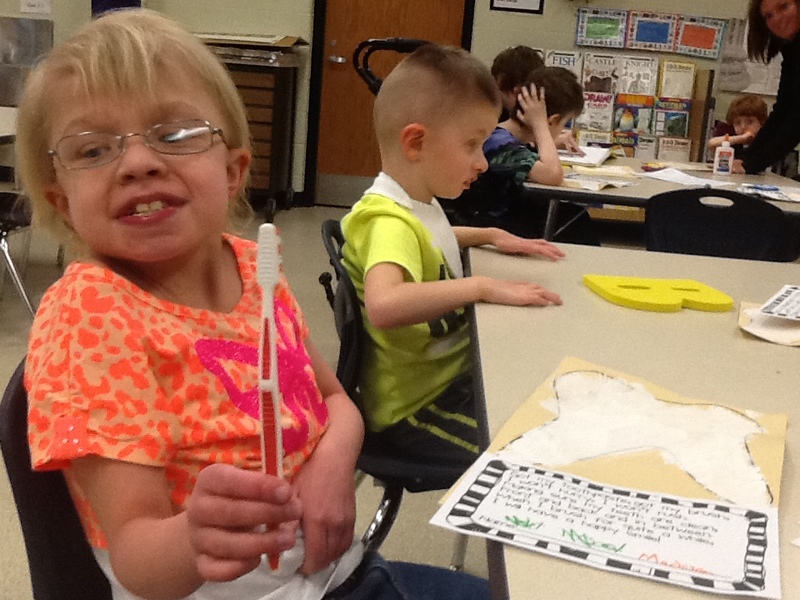 Here are some things we have done in our adaptive art class! 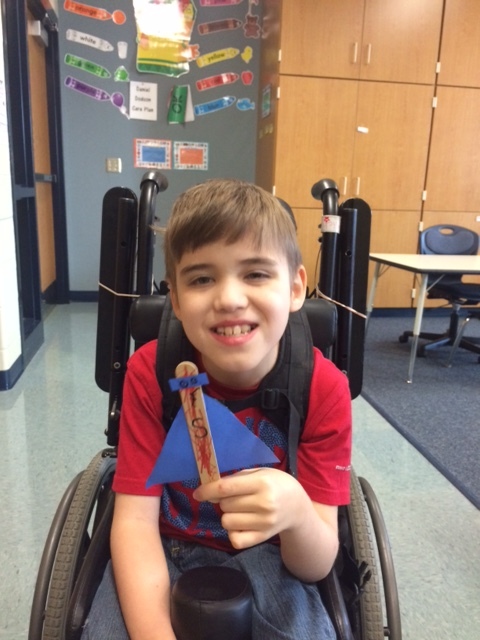 We watched a clip on our iPads about superheros and then created our own superhero with a Popsicle stick. We then discussed what type of super power we would choose if we were a superhero. We talked about the importance of brushing our teeth. 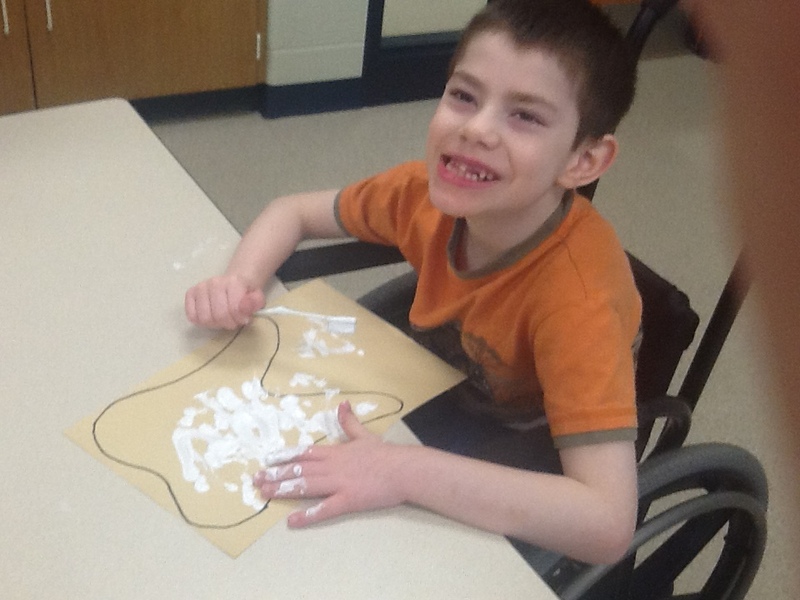 Students drew a large tooth on their paper and “brushed” their tooth with white paint. The kids LOVED “brushing” their tooth with white paint, look at that grin! We glued the rainbow colors on a black strip of paper. I then put a variety of materials and colors (pom poms, pipe cleaners, beads, tissue paper etc.) and the students glued the materials to the matching color strip. In the Video below I covered the tables with white paper and filled the page with different intersection roads. I taped markers to matchbox cars so when the students “drove” the car the marker would drag behind and make a line wherever their car went! This was a big hit, the students were even making “Vroom Vroom” noises! One thing we do at the end of every art class is we use our Velcro mats and review our project. 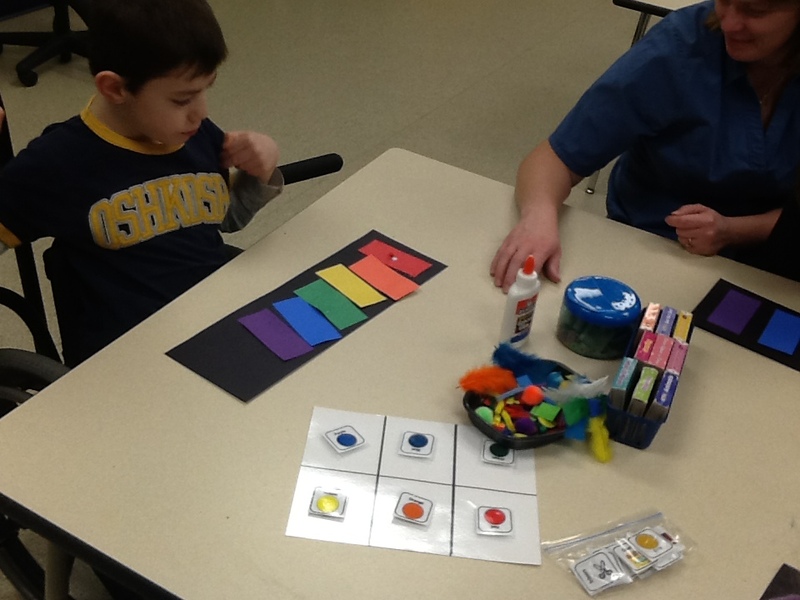 We put on our chart what colors and materials we used in art class that day OR I will have the table chart already filled out so that they know what to expect and what materials we will use that day. I really need to improve on taking pictures of my lessons to post and share with you! Have you ever heard of Artsonia? It is pretty much the greatest website/app ever! Artsonia is an online art gallery for students to photograph their artwork and publish it to THEIR own folder on the site. The artwork in their folder stays forever from year to year. This is an awesome way for students to share their artwork with friends and family that do not live close to them. Friends, family, and teachers can comment on their artwork for the child to see! Trust me, you will not see a bigger grin on a child’s face than when they receive a comment on their latest masterpiece! Not only is it a way to connect with parents, but a way to visually see the growth in art throughout the years! Wanna know the best part?! Grading and assessing student work is a breeze! I no longer have to lug home or sort through piles of large paintings, clay pieces, or sculptures. I just open up the project on my iPad and swipe through all of the photographs and record their grade. This is my Artsonia upload station. Basically, after every project students will photograph their artwork and upload it to their online art portfolio. They are able to write artist statements as well! This is a great way to show growth over the years. The talk EVERYWHERE in education is about integrating technology into your lessons in all subject areas including art, yes I said it, EVEN ART! As much as I love the thought of creating art “old school” style with just construction paper, scissors, and glue, students can still use technology to explore their creativity and think outside the box! This doesn’t mean you have to completely cut out the physical production of art, you can just add a technology element to your existing art lessons. I have fallen in love with the use of technology in the art room, so I want to share one way that I incorporate technology in my curriculum. Lesson Objective: Students will learn about drawing self-portraits using correct proportions. We will talk about superheros and create a self-portrait using an onomatopoeia. After the portraits are painted the students will use the app ChatterKid on their Ipad. If you aren’t familiar with Chatter Kids, this app allows you to take a picture of anything, draw a line through it with your finger creating a “mouth” and record yourself talking. The kids took a picture of their self-portrait and drew a line right where their mouth would be and recorded themselves talking. They could tell a story about them saving the day, how they became a superhero, or something else regarding them being superhero. After they were finished recording they would hit the “share” button on the app and email it to me. After I received the emails I uploaded all of their videos to YouTube and created a QR code for each video. You’re thinking, “Wow! that had to of taken forever!” No it actually didn’t, each video only took a few seconds to upload and once I got into a groove of uploading and printing the QR Code I was done in no time! The students glued their QR code on their picture and I put them up in the hallway for parents, teachers, and other students to scan with their QR reader and watch each students artwork come to life! It was remarkable looking out my classroom door into the hallway and seeing visitors scanning the QR codes watching and laughing at the videos. It was well worth the extra time I put into this lesson! If you want to learn more about this please comment below your e-mail address! I am always curious about how other teachers set up their room and how they have it organized. Every classroom is different and every teacher has a different vision for their space. So here we go, Welcome to my classroom! Each of my 8 tables has a different color star on it. This is used for me to call out tables. The QR code is a whole different story, Ill save that for another post! These tubs are behind my demonstration table, I keep current project materials in them for each grade level. for example, paper, teacher examples, photos, small supplies etc. I often refer to this when students are completing a project, they love it! I always hear, “Am I at an A-Awesome?” The visuals are a great reminder for students to see what good quality work looks like. Here is my cool down area. The box contains stress balls, velcro, silly putty, a bottle of colored water and glitter, and other fidgits! I separated my books in two categories, Art Books and Regular books (fancy huh?) The art books have a pink sticker and the regular books have a blue sticker, the shelf is labeled so books are put back on the correct shelf! This is my clay process board. Down at the bottom I have sample tiles of each glaze color, these are put up with velcro so I can easily remove or change them! This is my lesson board. I have the objective and standards for each lesson posted for each project for each grade level. Underneath is a strip of velcro, this is so I can put up the key words for each lesson. Clean up jobs! The table color rotates each week. So there it is! My home away from home! Please share, what does your classroom look like? My name is Morgan McClarnon and I am a 2nd year Art Educator. (Art “Educator” sounds way cooler than Art “Teacher”) I always knew I wanted to become a teacher, I mean c’mon, I played school everyday after school. Of course, it was more fun being the teacher than the student! My real passion for art did not come until high school. I took every art class possible. My bachelors degree is in Art Education from IPFW. Although, four years of college couldn’t prepare me enough for the amount of work, shock, passion, stress, and fear I was about to encounter during my first year teaching at North Side Elementary. I decided to start this blog to reach out to other Art Teachers to see if they are as crazy as I am?! Kidding, but not really… My goal is to virtually collaborate with teachers, share tips and tricks, brainstorm ideas, and give one another a good laugh by posting funny things your students say. We all need a good laugh after you have one of “THOSE DAYS”. 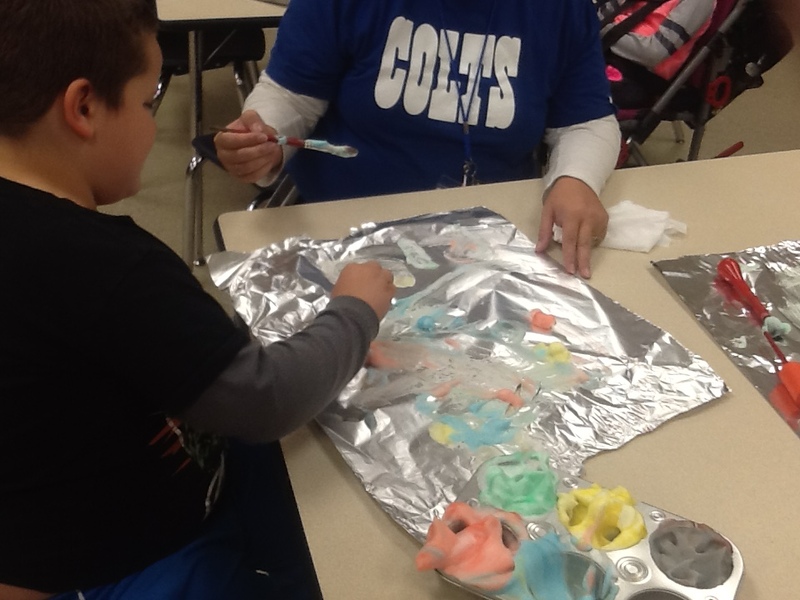 I teach K-6 Art, two ED (emotional disability) classes, and FLS (Functional Life Skills) sensory art. I am looking forward to connecting with other educators and aspiring educators.